Nokia 3310 refresh launching in India in 2017 The New Nokia 3310 is Comming soon In Some Others Country as Well.With the iconic Nokia 3310, the company also brought back the Snake game. 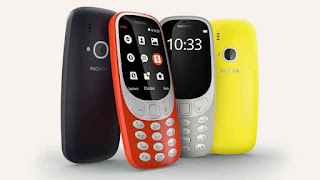 The Nokia 3310 sports a 2-megapixel rear camera with LED flash.It comes with 16MB storage and supports expandable storage via microSD card (up to 32GB). It packs a removable 1200mAh battery.